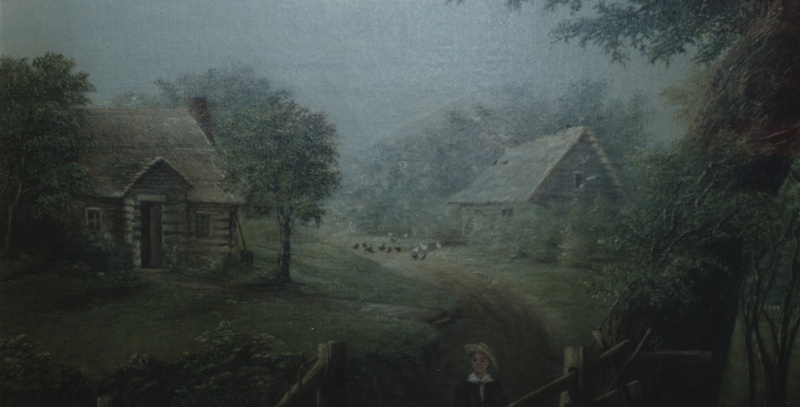 This post is a continuation of a post I wrote yesterday on a series of three oil paintings that are said to have been painted by my 3rd-great-grandmother, Elizabeth Miller McMurry (1828–1876). In today’s post, I’ll be taking a closer look at one of the paintings (the pastoral scene with boy and cattle), and looking for hints as to the date(s) and settings of the paintings. My grandmother’s first cousin, Art McMurry, the owner of the paintings until his death twenty years ago, said that they were painted by Elizabeth while she and her husband were traveling west by wagon. If true, these canvases would have been painted at some point between Elizabeth and Luke’s marriage in 1851 and Elizabeth’s death in 1876. She never made it further west than Arkansas, but her family later reached the area near Olympia, Washington. From what I can tell from the images I currently have available, nothing about the paintings or their mounting and framing is inconsistent with dating from the mid-to-late nineteenth century. 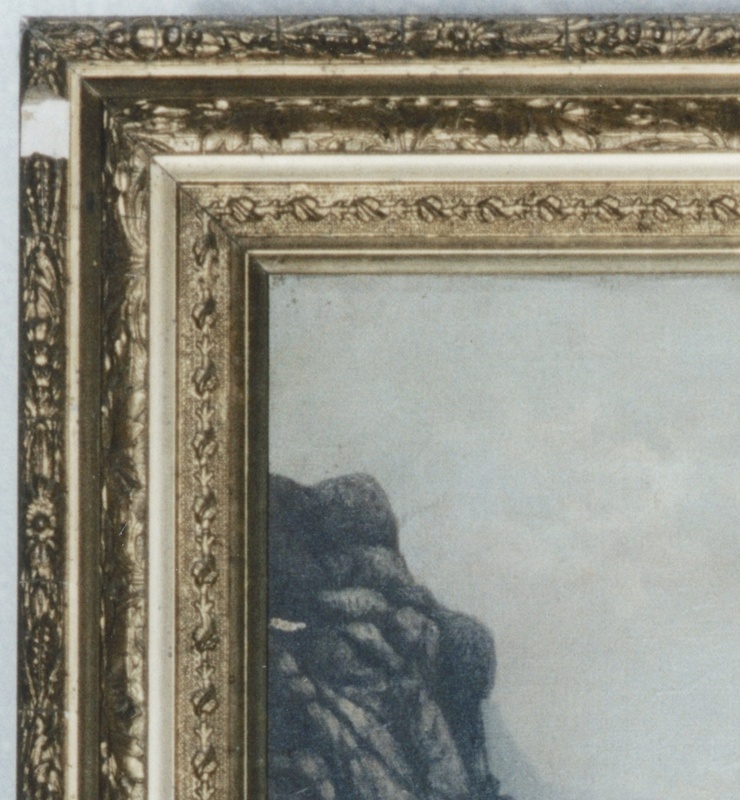 From what I can tell as a someone who’s not an art historian or paintings conservator, the frames are consistent with a mid-to-late nineteenth century date. Such gilded wooden “aesthetic-style” frames were popular at the time and were mass-produced in the 1870s and 1880s. 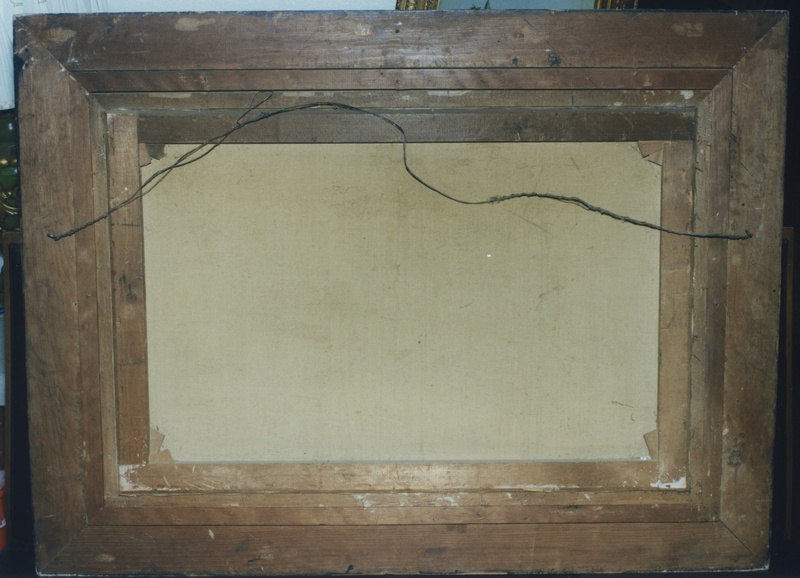 Of course, the frames may date to roughly the same time period as the painting, they may have been older frames that were re-purposed, or they may have been added at a later date, perhaps by her son James “Jim” Miller McMurry, the owner of the paintings for probably at least a couple of decades. The style, subjects, and medium of the paintings are similar to other American paintings from the mid-nineteenth century (see examples below). 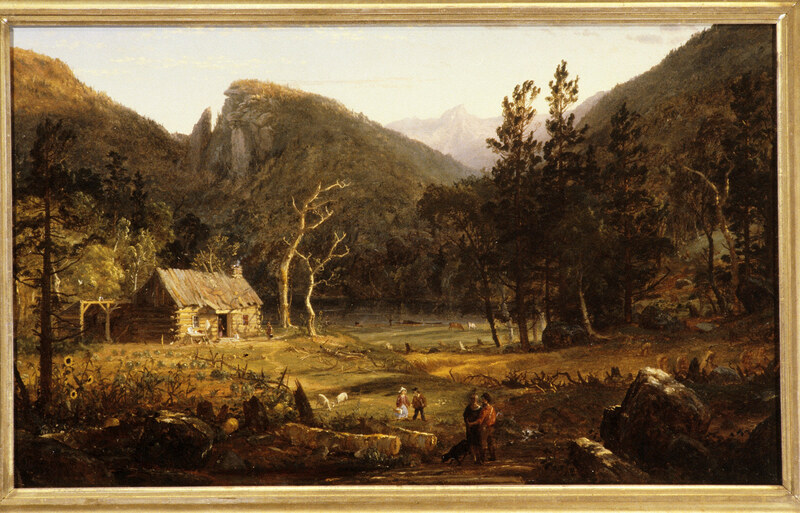 Artists who produced similar works include Joshua Shaw (1777–1860), Albert Bierstadt (1830–1902), and Jasper Francis Cropsey (1823–1900). 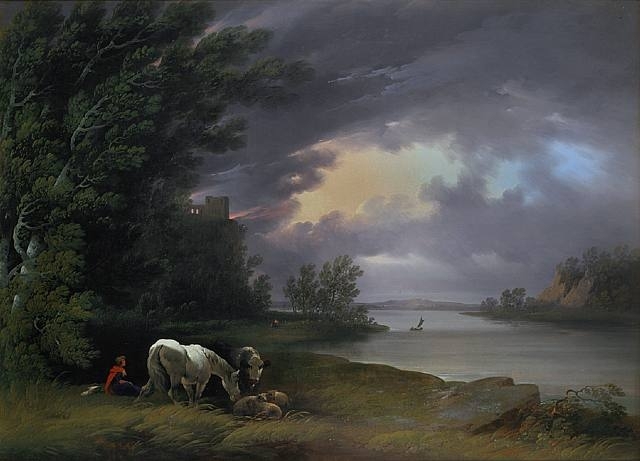 In the top left quadrant of the pastoral scene, there are two buildings visible, as seen in this unaltered detail photograph: With some minimal image processing to reduce the effects of the hot spot from the camera’s flash and the heavy shadows due to the poor general lighting conditions, the details and colors become clearer (as do the reflections: ignore the red and black ghosts at the upper right of this image—that’s the camera lens and my hand, reflected in the varnish): The structure on the viewer’s left appears to be a log cabin serving as a house, and the structure on the right appears to be a barn, stable, or cow-shed. A wide path or road runs from where the boy is standing, continues past the log cabin, and then past the barn, and then fades into the distance. A path forks off the road and leads into the barn through a barely visible entrance. In the foreground, a flat and narrow path leads from the cabin’s front door, ending at a pair of stair steps down to the level of the road. It’s hard to tell from the photos I have, but the cabin path may have been paved with stones or wooden boards. The cabin is a single-story log cabin with a tall roof, probably yielding generous loft space inside the cabin. The design is somewhat elaborated over a simple, rectangular log cabin as it possesses an extended, gabled front entry. The cabin appears to be built with chinked logs that join at the corners with interlocking saddle notches. There are two glass-paned, shutterless windows on the front wall of the cabin, and a brick chimney on the barn side of the cabin. A butter churn can be seen leaning against the wall of the cabin. Over a dozen chickens—some black, some white—are feeding at the the junction of the road and the barn path. Close to twenty crows, pigeons and/or doves (or other medium-sized black or white birds) are standing on the roof of the barn or flying nearby, including three light-colored birds that are flying toward the barn’s hayloft hatch. In front of the barn is what appears to be a small orchard of young trees. The tree alongside the cabin path also appears to have been deliberately planted. The barn appears to have a thatched roof (from the spacing of the purlins visible under the barn’s eave). The cabin may also have a mostly thatch roof, as the long, thin details on the cabin roof suggest thatch, although the roof over the entry may be shingled. There are six adult cattle and one calf in the painting. All except the calf have horns—short, curved, vertically pointing horns. The calf and three of the cattle are brown, two cattle are black, and one cow is white. One of the black cattle is drinking from a trough that is supplied by a fountain. The fountain’s construction isn’t clear, but it appears that the spigot may have been a hollowed-out tree branch. A long picket fence with closely spaced fence boards can be seen at least partially enclosing the property. The property itself has undulating topography and apparently was originally forested. Most of the trees in the painting appear to be old growth deciduous trees. 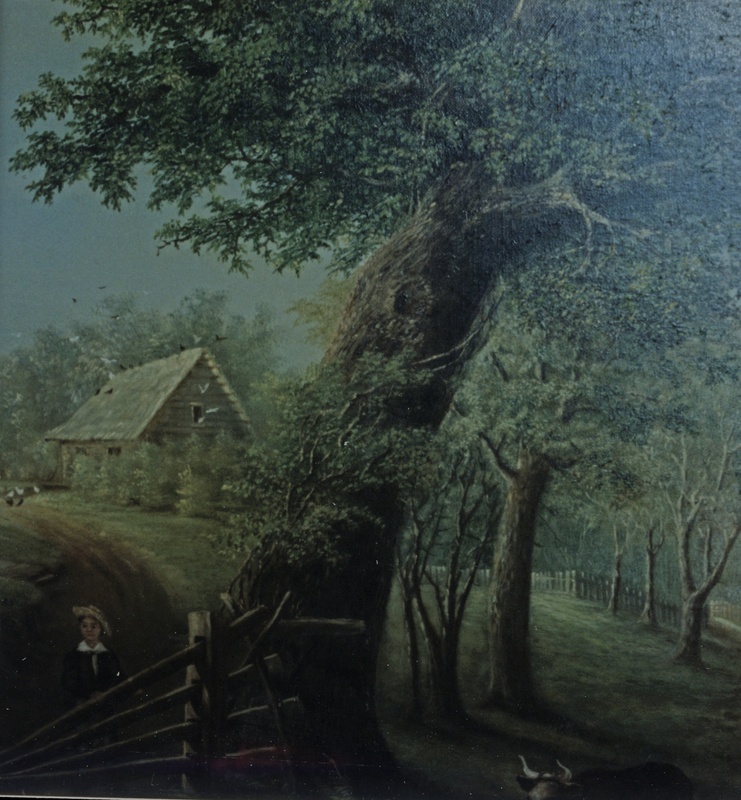 One at the far right of the painting has been felled with a saw, and the large tree in the center has a woody vine winding up along its trunk. There is a gate across the road just to the right of the cattle trough. The gate has a distinctive design—it was constructed in a manner similar to split-rail fences, but each of the four rails can be slid to one side and pulled out of one of the fence posts, making it easier for people and horses (and perhaps cattle) to pass. Behind the split-rail gate is a young boy. He’s wearing light-colored trousers, a dark blue or black long-sleeve shirt (or perhaps a jacket), a white bandana and a straw hat. The boy’s hands are grasping the upper and lower surfaces of the top-most rail of the gate, as if he’s just finished lowering it. The boy appears not to be tending the cattle as much as just gazing at them, as if wondering what he might want to do next. It’s tempting to think that Elizabeth painted this from life, and that the young boy is one of her two sons, Arthur or James. If it is indeed painted from life, and if the boy (who appears to be about 8 years old) is indeed either Arthur or James, then the painting would date to around 1862 (if Arthur) or 1865 (if James). Elizabeth was born and raised in St. Joseph County (near South Bend), Indiana, and married her husband Luke there in 1851. She and Luke had moved to Effingham, Illinois, by 1854, when their first child (Arthur) was born. They lived in Effingham for two decades, during which time Luke was both a farmer and a merchant. Among other things, he was in a Chicago-based partnership selling wholesale straw and millinery materials, so straw hats on his boys would have not been unusual. Luke’s business in Chicago would have also made it relatively easy for him to purchase canvasses, paints, brushes, and frames for his wife. They remained in Effingham until at least 1870 (possibly 1872–1874), and then departed for Arkansas (presumably by wagon, as most migrants to Arkansas did at that time). If it was painted in 1862 or 1865 or thereabouts, the painting would have been done in Effingham, presumably on their property. From what I can tell from aerial imagery, the land to the west and east of Effingham is still undulating and forested in many areas. Images from Hidden Springs State Forest, just 12 miles away, are consistent with the landscape seen in the painting. As their census address was alternately described as “Douglas Township” and “Township 8, Range 6E”, the location of their home can be narrowed down to just that area where both names overlap (area highlighted in red on 1875 plat below). If they were living to the south of town, then they would most likely have been living along Salt Creek in the southeast corner of the area shown above. If they were living to the north of town, then they would have most likely been living along Green Creek in the northwest corner of the area shown above. 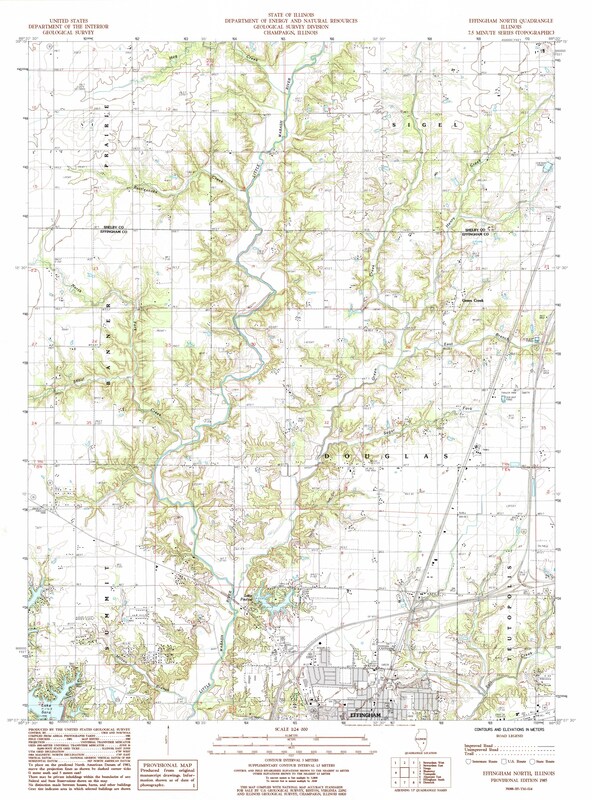 Surviving buildings are shown on USGS 7.5° topographic maps, like the one of the Green Creek area (below). So far, the earliest 7.5° topo map I could find for the area is from 1985, possibly 120 years after the painting was created. If I can find earlier topo maps or plat maps, I may be able to further narrow down the search for their old home. If the buildings and topography of their old Effingham home matches that seen in the painting, then I think we’d have a strong case for the painting being a depiction of the McMurry home in Effingham. If you can add anything to this story or can extract information from any of the clues in the painting, please tell me about it in the comments section below! This entry was posted in 1860s, 1870s, Arthur W. McMurry, Elizabeth Miller, James M. McMurry, Luke R. McMurry and tagged Illinois, Indiana, Washington by Michael. Bookmark the permalink.